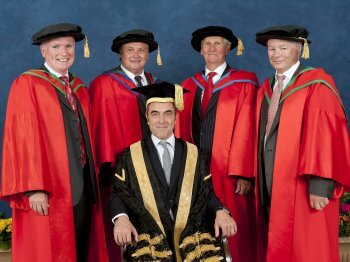 THE CURTAIN rose on a new role for actor James Nesbitt today when he was formally installed as the fourth Chancellor of the University of Ulster. “When it came for us to identify a new Chancellor, James Nesbitt was the obvious and unanimous choice. “He is from Northern Ireland, he has excelled in his chosen career, and he has never forgotten his roots. “Also, his work as a UK Ambassador for UNICEF and the charities with which he chooses to become involved demonstrate his clear commitment to helping the least advantaged members of our society, something that through our widening access and international development initiatives this University values most highly. Addressing his audience, the new Chancellor said he was thrilled about taking on this exciting new role, and looked forward to engaging with both staff and students in assisting and celebrating the work of the university in all its facets. “ I believe the University of Ulster is dedicated to helping our young people achieve their aspirations – and that is something that I can identify with. Dr Nesbitt said that he was determined to act as an ambassador to promote the importance of the University sector in helping ensure government realises the important and value of higher education. Praising the University’s North-west and Belfast development plans, Dr Nesbitt spoke of their potential for stimulating the economies of both Northern Ireland’s leading cities, and applauded Ulster’s unwavering commitment to its home town of Coleraine. He spoke of his long connection with the University’sRiverside Theatre, where his acting career began at the tender age of 13, and paid special tribute to the loving support and encouragement he had received from his family, and particular from his father James, who was in the audience. The ceremony also saw honorary degrees awarded to distinguished actor Conleth Hill, and leading businessmen Dr Peter FitzGerald, Tony Hopkins and Bro McFerran. Mr Hill received the honorary degree of Doctor of Letters (DLitt) for services to the arts; Mr Hopkins the honorary degree of Doctor of the University (DUniv) for services to higher education and economic development; Mr McFerran the honorary degree of Doctor of Science (DSc) for services to economic development and Dr Fitzgerald the honorary degree of Doctor of Science (DSc) for services to economic development. Dr Nesbitt is the fourth Chancellor of the University since its founding in 1984. His predecessors were Sir Richard Nichols, Baroness Rabbi Julia Neuberger, and Lord Grey of Naunton.